TL:DR: From its hybrid engine to its tyres and aerodynamics, the Formula One car is a machine optimised for speed. Assembling each car requires expertise from a range of scientific disciplines. As F1 fever hits Singapore’s shores, find out more about the technology powering these speed demons. The larger-than-life racers, the revving of the hybrid 1.6-litre V6 engines, the high-speed cornering and overtaking—what’s not to love about a sport that marries man and machine in a 300-kilometre-per-hour dance on asphalt? Formula One (F1) has more than 500 million fans all over the world, and some among that horde have descended on Singapore for an exhilarating night race on the floodlit streets of Marina Bay. While the race remains the top attraction for F1 enthusiasts, the engineering elements and technical minutiae of F1 cars have their own dedicated following. 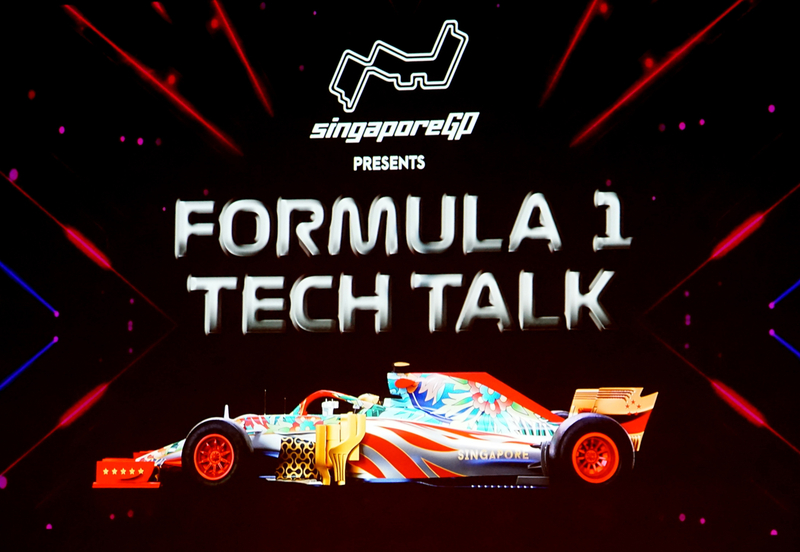 On the evening of 12 September 2018, an audience of race car ‘geeks’ was treated to the inaugural F1 Tech Talk, held at the Victoria Theatre. Gracing the event was Senior Minister of State, Ministry of Trade and Industry & Ministry of Education Mr Chee Hong Tat, who in his opening address noted that “technologies pioneered by F1 cars rely on a wide range of scientific disciplines, including materials science, mechanical engineering, data analytics and high-end computing”. This set the tone for the rest of the evening, which saw three speakers—Mr Ross Brawn, managing director of motorsports, F1; Mr Mario Isola, head of car racing, Pirelli Tyre S.p.A Motorsport; and Mr Gautham Ramesh, computational fluid dynamics (CFD) methodology engineer, Salient Edge—touch on the technical side of F1. “Like a lot of young boys, I wanted to drive, but I figured I was useless at that, so I went into engineering instead, which I found equally rewarding,” said Mr Brawn, who is something of a legend among the F1 community for his technical expertise and race track record. In 2009, he acquired a sputtering Honda team, renamed it Brawn GP and went on to win the F1 Constructors and Drivers Championships in that year. He eventually sold his team to Mercedes-Benz in 2010 but remained team principal, leading it to three consecutive victories from 2014 to 2016. Giving the audience a glimpse of what to expect from F1 car engines in the future, Mr Brawn explained that “we’re making it a bit noisier [a nod to complaints that the V6 engine was too quiet], a bit more powerful”. He also highlighted that the engines have broken the 1,000-horsepower barrier, setting the stage for higher top speeds and more exciting races. Yet, impressive as this may be, the engine is just one enabler of the F1 car’s incredible performance. 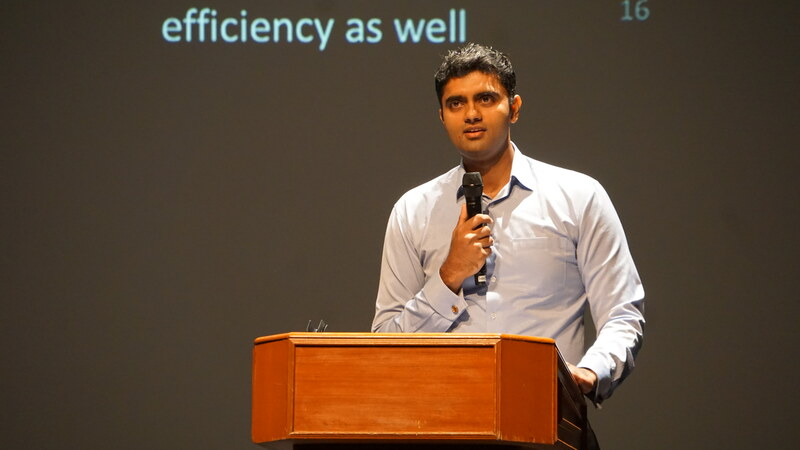 Another key element is aerodynamics, a research domain that Mr Ramesh is no stranger to. A Singaporean who has worked with the F1 teams of Scuderia Toro Rosso, Williams, Lotus and Marussia, Mr Ramesh uses CFD to simulate and evaluate a car’s aerodynamic characteristics. “CFD is the science of predicting fluid flow, heat and mass transfer by solving a set of mathematical equations using a numerical process,” he said. F1 teams hence use CFD to visualise and identify vortices and other flow structures. This information can then be used to develop and design control surfaces to generate downforce, which pushes the car down onto the road, allowing it to round corners at higher speeds. “CFD is also being used in fuel tank baffle design,” Mr Ramesh said, referring to structures in the F1 car’s fuel tank that help keep petrol from sloshing around. By modelling the G-forces experienced by the fuel in the tank, baffles can be optimised such that fuel is channelled efficiently to the pump at the base of the tank, thereby reducing the likelihood of power loss to the car during races. Having covered the engines, aerodynamics and fuel tanks of F1 cars, the speakers next turned to innovation relating to F1 tyres. 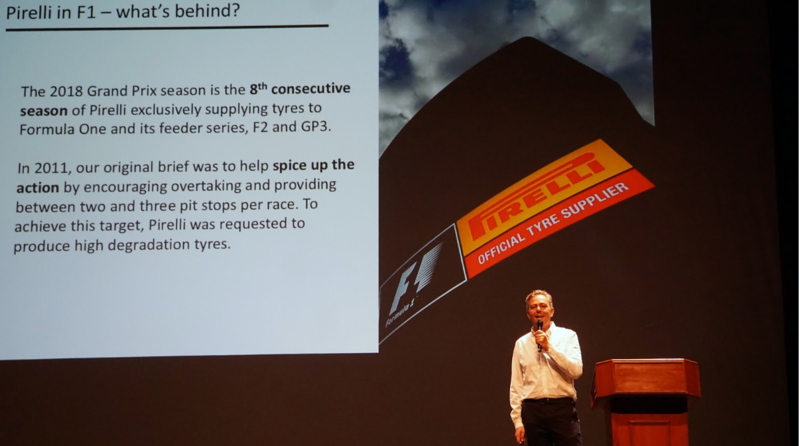 Mr Isola explained that Pirelli produces a range of compounds—blends of natural and synthetic rubber materials—that influence the rate of tyre degradation during races. While tyres for normal road require durability, the tyres used by F1 cars are in fact designed to degrade so as to encourage two to three pit stops during the race, which means that teams must choose their compounds wisely and decide when to call their car into the pit. “We always try to have three compounds with a delta lap time of roughly one second between two different compounds, and with different levels of degradation to give teams the opportunity to design different strategies,” Mr Isola elaborated. Such precise control of tyre properties requires materials science as well as novel production methods; Pirelli thus collaborates with universities in Europe to bring novelty to the F1 circuit. Clearly, F1 races are a showcase of science as much as an adrenaline-pumping spectacle. “F1 is a fantastic catalyst , to inspire young people, either directly or indirectly, to become interested in STEM (science, technology, engineering and mathematics) topics,” said Mr Brawn. So the next time you hear the roar of an F1 car’s engine, remember the science that has made this exciting motorsport possible.